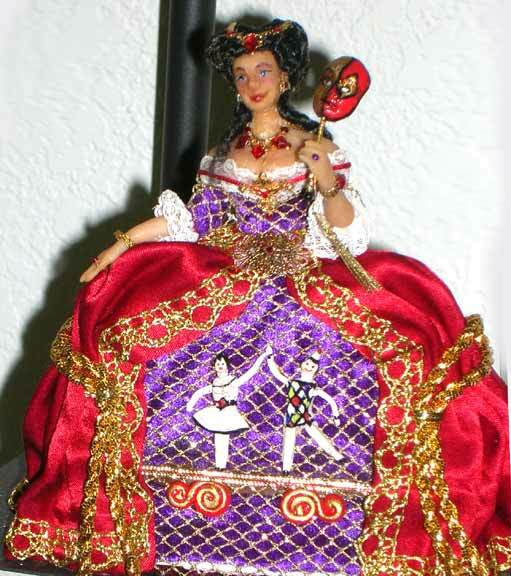 I thought I'd dazzle you with dolls today since I've been sculpting up a storm! 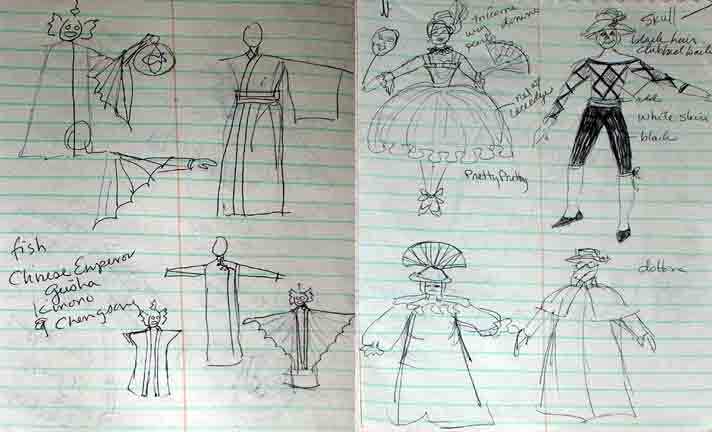 and Birdcage--she and Puppet Show have bublous heads to support their future hairstyles. 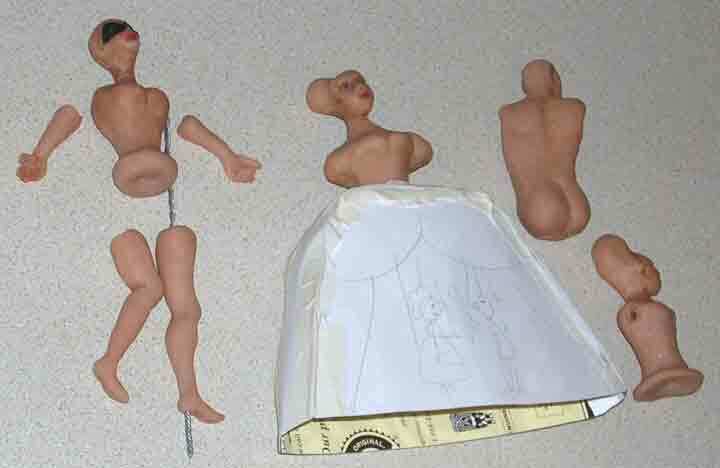 I've done heads/shoulder plates for the rest of the dolls, plus some of the feet. 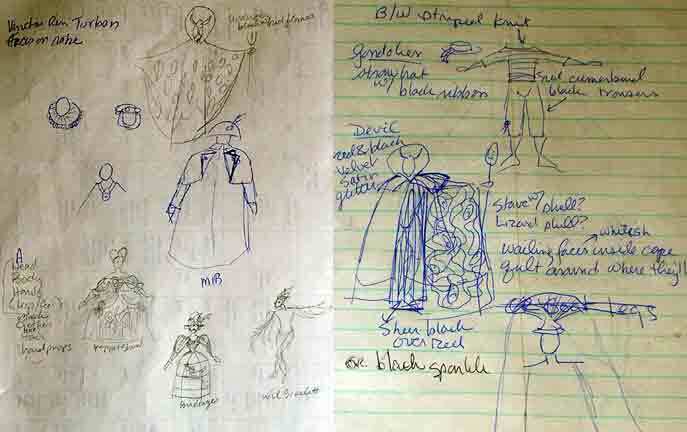 These are sketches of some of the costume ideas; you can see a couple of different ideas for the devil. And these are some of the fabrics I've collected for the costumes; the Fish in orange and gold, Devil in red and black, and Columbina in white and cream. Birdcage Skirt was coming along nicely, until I realized she had no intention of wearing the birdcage. 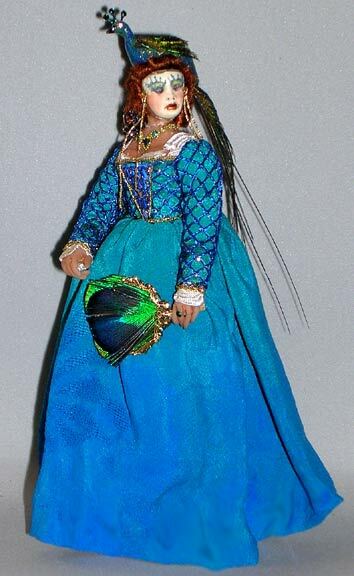 It's rustic, but I didn't have any blue fabric, so I used teal and she turned into a Renaissance lady; the color is just too sophisticated. So she's now "Peacock" (I had to work that bird in somehow!) 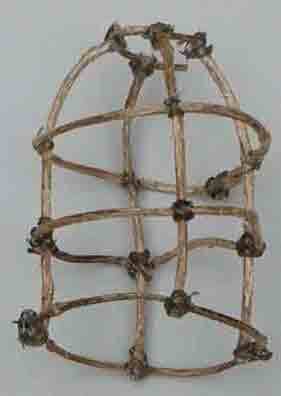 I'll start over with a new doll for the birdcage using earth tones--beige and brown and ochre. Pantaloon wasn't speaking to me, and I realized that he doesn't fit in with the "gilded youth" concept, so he's been scratched. That leaves me with four females, five males, and the androgenous Fish. 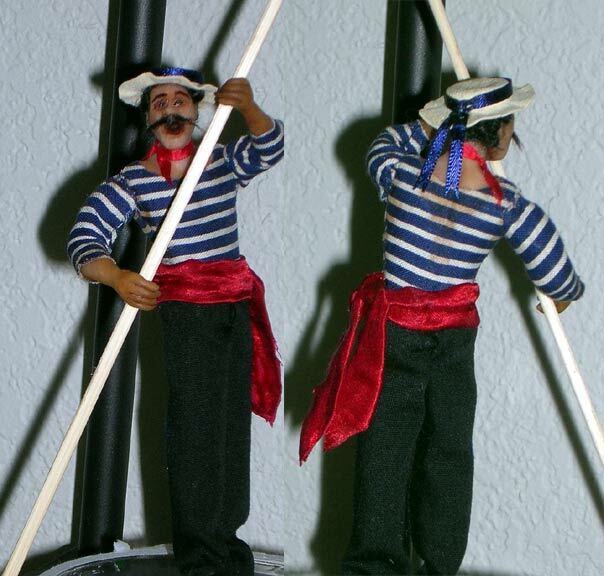 I finished sculpting arms and legs for everybody but the gondolier; I think his legs will have to be short, so I'll wait until I figure that out. The armless wonders! Fish, Peacock, Skull, and Devil. They'll all get their arms eventually, as well as robes and cloaks and hats and masks. I guess I'm not limiting the colors to black, white, and red after all! Another major accomplishment this month: I turned 50 on the 9th! I'll commemorate that by increasing the font size on my web pages from here on. Dolls dolls dolls dolls dolls! Four dolls are actually finished, and I even like them! 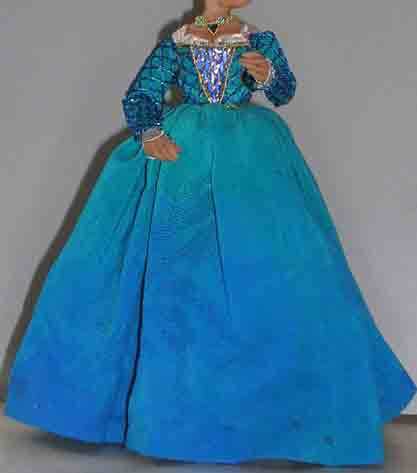 I have long had a rule about dolls; they aren't finished until they have a hat and something in their hand. 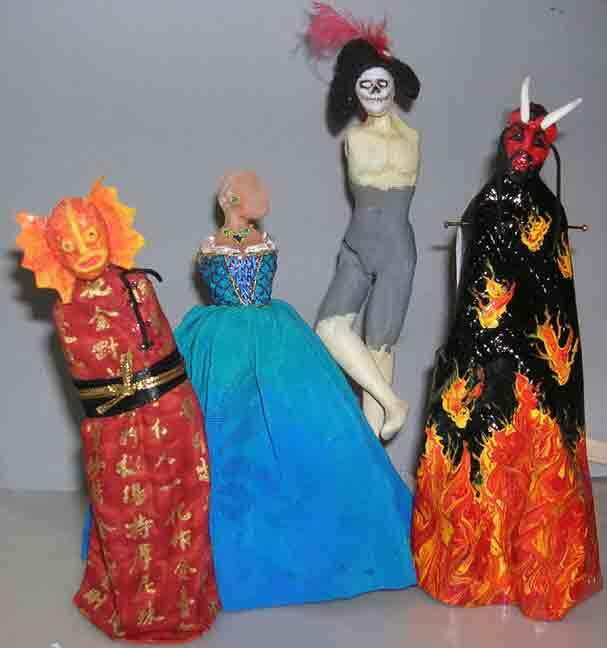 For this project, I also require each doll to wear or carry a mask. Puppet Show wound up with black hair instead of white, so I painted her head bulbs/wig supports black before wigging. I used my new favorite wigging technique, squiggling sausage curls randomly all over her head. Peacock; her mask looked fine in person until photographs showed how awful it was; she's got a new mask in progress. the Gondolier was originally going to be singing O Sole Mio, but I got tired of that song while working on him (of course I sang while working on him. I don't actually know the words, so sing it, "O sole mio, o sole you-o, o sole us-o...you'd get tired of it, too) Now he's singing That's Amore because I know more of the words. He's sweaty and grubby--the only working man in the bunch, and the only doll without a mask. No gilded youth for him! Skull/Harlequin's shirt is paper glued snugly over his sculpted torso. 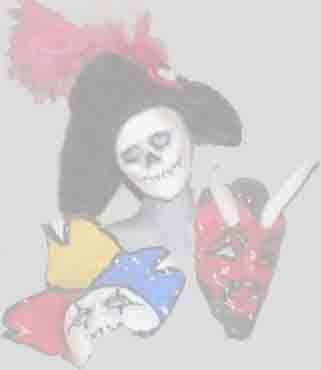 I couldn't find good harlequin diamond fabric, so printed black and white diamonds, then painted in the other colors. Yes, I could have printed it all in color... His trousers fit even more tightly; they're painted on. My husband says I'll never fit 10 dolls in the scene, and he's probably right. I figure I'll work on the ones that catch my interest the most, then once the scene is together, make more dolls if I need to. Working on Wil Scarlett, I realized I didn't have a wire coming out of his foot to mount him. Broke his foot off trying to make a hole (should have used a drill, not an awl), then decided he should sit on the bridge railing. I cut both of his legs at the knee, rebent them (there was wire all through his legs, just not coming out the bottom), then used air-dry clay to fill in the gaps in knees and mended foot. Also used the air clay to sculpt his boots and hat. Birdcage suffers disaster after disaster! First she loses her doll, then the cage sprouts mildew! I put it outside in the sun to dry out, forgot and about an inch of rain dissolved the glue and the whole thing fell apart. Guess I'll move her to the back burner for a while. I'm still on the trail of my mysterious inspiration picture. I had a Barnes and Noble gift card, so went shopping and came across the book I think I saw it in, "Ready-to-Use Old Fashioned Silhouettes" from Dover. Only $1.99! I also ordered books on Art Deco, Art Nouveau, Erte, Beardsley, and one on the motion studies of Edweard Muybridge (to help with posing dolls, and because they're really cool and I've always wanted a set). Why haven't you been working on this, Lee?